In this first video of this series, I’m going to explain step 1 in detail, and give you a great exercise you can do to help you with it. In part two and three, I’ll share with you how to do the other steps and how to put it all together. My goal for this video series is not only to help you learn to transform your relationship with stress, but also to help you reduce the collateral damage inflicted on those around you when you’re feeling stressed. Today we’re going to tackle the big one: stress. 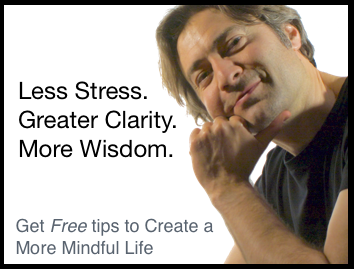 In this 3 part series I’m going to show you a simple technique I call Stress Surfing, which is a way of using mindfulness to transform your relationship with stress. In this first video of this series, I’m going to explain step 1 in detail. In part two, I’ll show you how to do step 2 and in part three, I’ll talk about step 3 and wrap the series up. Now, when I say you first need to recognize that you’re feeling stressed, that’s pretty obvious. But, you might be surprised how often you act in a certain way, or say certain things because you’re stressed, without actually realizing that that’s what’s going on. 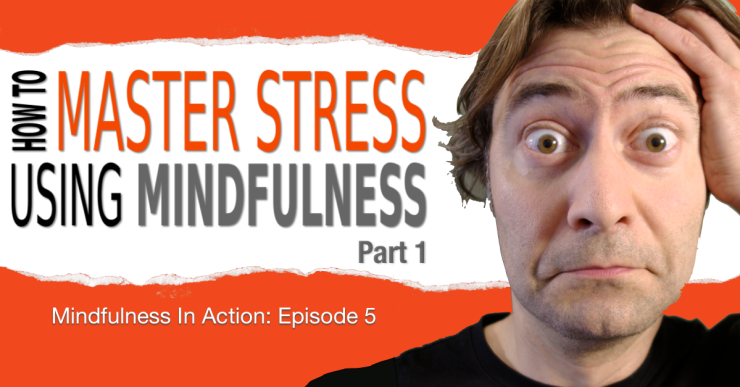 My goal for this video series is to help you learn to transform your relationship with stress, but it’s also to help you reduce the collateral damage inflicted on those around you when you’re feeling stressed. Before I can explain exactly what I mean by recognize that you’re feeling stressed, I need to back up a bit. Let me start by saying that I’m not going to go into a detailed examination of the physiology and psychology of stress in this video. While that’s pretty interesting stuff, it’s actually not necessary for understanding how to use the Stress Surfing technique. In fact, when you look at it this way, you’ll see that stress is just a word, it’s a concept. It doesn’t actually exist as a thing. It’s just a bunch of physical sensations and mental activity that we’ve labeled as stress so that it’s easier to talk about. It turns out that, just by viewing stress in this way, you begin to change it from being this nebulous, highly unpleasant thing to something very concrete that you can work with. So, the first step in Stress Surfing is to identify what these physical sensations, thoughts and so on are. When I’m feeling stressed, I know it by the twisting, nauseous feeling in my gut, the tension in my jaw muscles, the tightness in my diaphragm, and an overall kind of slight panicky feeling. I have thoughts like: “I’m stressed”, “this is too much”, “I can’t handle this”, “I need to escape” and so on. Now I want you to do it. I want you to remember a time when you were feeling stressed. Can you remember what that felt like in your body? What were the physical sensations? Where were they located? Now do the same for the thoughts, emotional states and other mental activity. Can you remember what thoughts were going through your mind at the time, especially repetitive thoughts? If this exercise is difficult for you, then try identifying these things the next time you’re actually feeling stressed. And write down what you discover. The goal is to get familiar enough with these sensations and thoughts that you can use them as your “stress early warning system”, because the sooner you recognize you’re feeling stressed, the easier it is to work with it. You may even notice that getting beneath the concept of “stress” to the underlying sensations and thoughts already helps you to handle the stress better. Ok, that wraps up part one of this series. Make sure you do the exercise and learn to identify the physical sensations and mental activity that are present when you’re feeling stressed. Then join me for part 2 of this series where I show you how to apply the power of mindful observation to those sensations. That’s where things start to get really fun. If you’ve got a friend who you think could benefit from learning the Stress Surfing technique, send them an email with a link to this video.